2+U, also known as 2&U, is a high-rise office building under construction in Downtown Seattle, Washington. The 527-foot-tall (161 m), 38-story tower will be located at 2nd Avenue and University Street and is scheduled to be completed in 2019. The building will have 725,000 square feet (67,400 m2) of leasable space, including retail and public spaces on the lower levels. 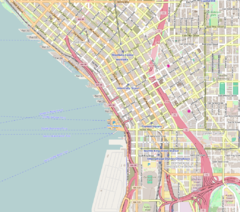 The 2+U project was originally announced in November 2014, after the signing of a lease agreement with Samis Foundation for their property at 2nd Avenue and University Street in Downtown Seattle. Developer Skanska selected Connecticut-based architecture firm Pickard Chilton to design the tower after a three-week "hack-a-thon" in which they competed with another firm, as opposed to a traditional request for proposals. The leasing center for the project used Microsoft's HoloLens mixed reality technology to create a virtual tour for potential tenants. The Seattle Department of Construction and Inspections approved the design of the tower in December 2016. An appeal from the owners of the 1201 Third Avenue tower against Skanska to prevent an alley vacation was dropped in January 2017, allowing for construction on the project to begin. Work on the $392 million tower began the following month with the demolition of the Galland, Seneca and Friedman buildings, as well as a vacant playground. The Diller Building, on the northwest corner of the block, was not included in the development and will remain under different ownership. Excavation of the tower's underground parking garage began in April 2017 and was completed in August, reaching a depth of 80 feet (24 m) under 2nd Avenue. The first major column, a 85-foot (26 m) "W"-shaped steel piece, was installed in April 2018. The tower was topped out in November 2018. The design of 2+U, conceived by Connecticut-based architecture firm Pickard Chilton, has been described as "dramatic" and "different" for elements at ground level. The tower will be supported by stilt-like "V" columns that rise 65 to 85 feet (20 to 26 m) above street level. The podium facing 1st Avenue will be 19 stories tall and include a landscaped rooftop deck. The main tower, rising 38 stories above street level, will have its own rooftop terrace and other amenities. In September 2016, the Seattle City Council approved an alley vacation for the project, exchanging the loss of a through-alley for promised public amenities. At the base of the tower will be a privately owned public space featuring an urban plaza with two stories of retail and restaurant space, public passageways and viewing platforms, public staircases with elevators to assist in hillclimbing, seating areas, and space for concerts and food trucks. Employment search engine Indeed will occupy 10 floors of the tower, leasing a total of 200,000 square feet (19,000 m2) of space. Spaces, a coworking subsidiary of IWG, will occupy three floors. Cloud storage service Dropbox will lease four floors, as part of an expansion of its Seattle office. As of 2019[update], 60 percent of office space in 2+U has been leased. ^ a b c "2+U, 670,000 Sqft". Skanska USA. Retrieved February 3, 2017. ^ "Skanska plans office tower at Second and University". Seattle Daily Journal of Commerce. November 7, 2014. Retrieved February 3, 2017. ^ a b Bhatt, Sanjay (November 7, 2014). "Skanska plans downtown office tower on Samis block". The Seattle Times. p. A10. Retrieved February 3, 2017. ^ Stiles, Marc (November 11, 2014). "Hack-a-thons: Now for architecture nerds and tech geeks". Puget Sound Business Journal. Retrieved February 3, 2017. ^ Bishop, Todd (April 5, 2016). "Seattle high-rise to use Microsoft HoloLens for 'world's first holographic leasing center'". GeekWire. Retrieved February 3, 2017. ^ a b c d Miller, Brian (December 28, 2016). "Skanska's 2+U tower moves ahead toward starting construction in 2017". Seattle Daily Journal of Commerce. Retrieved February 3, 2017. ^ Stiles, Marc (February 3, 2017). "With appeal settled, construction starts on 38-story office tower in downtown Seattle". Puget Sound Business Journal. Retrieved February 3, 2017. ^ Miller, Brian (February 6, 2017). "Alley appeal dropped, Skanska's 2+U tower now cleared to start". Seattle Daily Journal of Commerce. Retrieved February 6, 2017. ^ Stiles, Marc (February 10, 2017). "Why tower builder Skanska placed a $392 million bet in Seattle". Puget Sound Business Journal. Retrieved May 12, 2018. ^ "38-story office building planned". Seattle Daily Journal of Commerce. January 25, 2016. Retrieved February 3, 2017. ^ Stikes, Marc (August 31, 2017). "Here's the dirt on Skanska's 2+U tower rising in Seattle". Puget Sound Business Journal. Retrieved May 12, 2018. ^ "This 85-foot-tall 'W' is giving Skanska's 2+U legs to stand on". Seattle Daily Journal of Commerce. April 4, 2018. Retrieved April 4, 2018. ^ "Skanska tops out 2+U at 2nd and University". Seattle Daily Journal of Commerce. November 14, 2018. Retrieved November 14, 2018. ^ Enlow, Claire (November 12, 2015). "Design Perspectives: 2&U tower's design team attempts a heavy lift". Seattle Daily Journal of Commerce. Retrieved February 3, 2017. ^ Newcomb, Tim (June 12, 2018). "These 165,000-Pound Columns Will Heft a 38-Story Tower 85 Feet Off the Ground". Popular Mechanics. Retrieved June 12, 2018. ^ Seattle City Council (September 26, 2016). "City of Seattle Record CF 314320". Office of the City Clerk of Seattle. Retrieved February 3, 2017. ^ Stiles, Marc (May 18, 2015). "Concert venue, cantina could be part of Seattle office high-rise". Puget Sound Business Journal. Retrieved February 3, 2017. ^ "Approved Meeting Minutes, January 21, 2016: 1201 2nd Ave" (PDF). Seattle Design Commission. January 21, 2016. Retrieved February 3, 2017. ^ "Indeed takes 10 floors in Skanska's 2+U tower". Seattle Daily Journal of Commerce. December 19, 2018. Retrieved December 19, 2018. ^ "Skanska lands Spaces for 2+U". Seattle Daily Journal of Commerce. December 20, 2018. Retrieved December 21, 2018. ^ a b Stiles, Marc (April 9, 2019). "Bay Area tech company the latest to expand in Seattle". Puget Sound Business Journal. Retrieved April 10, 2019.